“Lula says: ‘This is hard work, Daddy.’ ‘It is,’ Daddy says. Has anyone else noticed how many superb picture books former editor and now-author Richard Jackson has been penning? I tell you what, they have been some of my favorite picture book texts in the last couple of years. Last year’s This Beautiful Day, illustrated by Suzy Lee; last year’s All Ears, All Eyes, illustrated by Katherine Tillotson; and 2016’s In Plain Sight, illustrated by Jerry Pinkney, are but a few examples. The legendary editor retired in 2005 and has taken up picture book-writing. Here is a great PW piece about him, published two years ago. 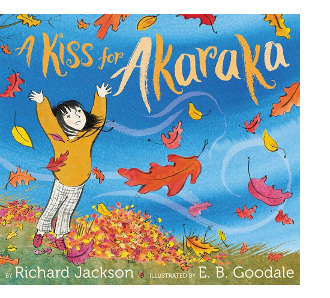 His newest picture book — A Kiss for Akaraka (Greenwillow), illustrated by E. B. Goodale — will be on shelves in late September. 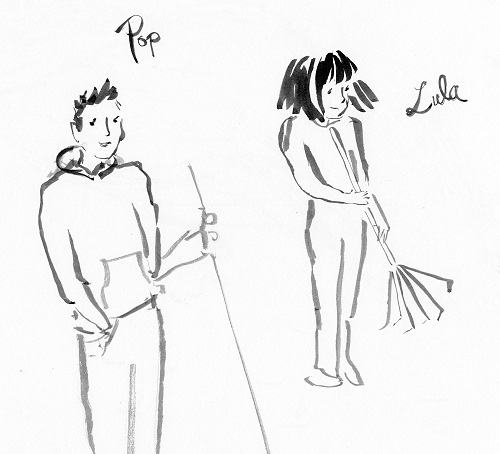 This is the story of a father and daughter (Lula) outdoors, raking leaves and discussing the girl’s imaginary friend, Akaraka. I just read the Kirkus review for the book, where the reviewer writes: “Questions about what we see and what we don’t see, what we know and what we don’t know ripple through this beguiling book like a playful October wind.” Ah, yes. Well-said. “Heaps and slithers.” Slithers. I love this. In particular, I love how the dialogue flows in this story with the natural stops and starts (and interruptions) that occur as a parent and child talk — especially about something as magical as an imaginary friend in a child’s life: “Her name, Lula-bee. Where—?” the father starts to ask. “I dreamed it, Daddy,” she responds. “One time, she was just right here, next to me.” I also like that one momentarily hesitates when pronouncing “Akaraka.” (Well, at least I did. Which syllables, I wondered at first, do I stress?) It is evidently a word in the Igbo language of southwestern Nigeria. Having to pause, particularly with the child with whom you’re sharing this book, and let the word roll across your tongue? I think that is lovely, as it slows down the experience of the story and allows the reader to linger in it a while. Goodale’s illustrations are equally enchanting. As the father calls for Akaraka (“Come along now, girl. We need your help here.”), he is always looking away from the imaginary girl’s presence in nature: Lula sees her outline in the Fall leaves flying through the air, in the wispy clouds, in a puddle on the ground. 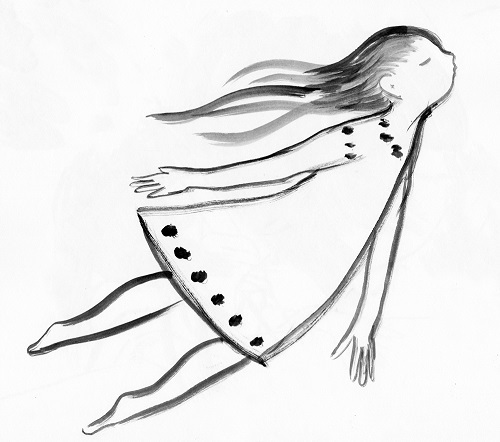 These are illustrations that breathe — they’re never too cluttered, never too hurried. E. B.: The first sketch is my very first rendering of the characters, Lula and Pop. They changed slightly in their final versions (Lula is a bit younger in the book), but I think I got their essence captured in this quick sketch. This below is a thumbnail of the spread where Akaraka is a cloud in the sky. This was the first spread I completed for the book and was a guide for style and mood. 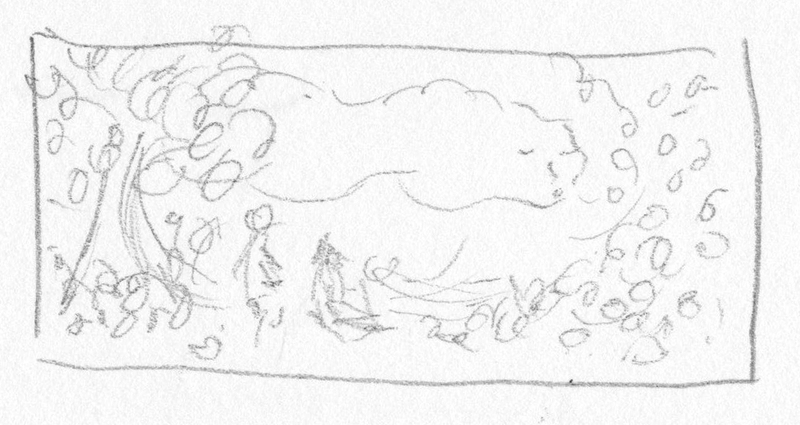 This thumbnail cracks me up, because it is silly and tiny — but actually looks pretty similar to the final! The third sketch is a quick rendering of what I imagined Akaraka to look like if she were a real girl. It helped me to have a control profile and style for her image, since she takes on many forms throughout the book. I wanted her to be recognizable, even though she is always made up of her environment. A KISS FOR AKARAKA. Text copyright © 2018 by Richard Jackson. Illustrations copyright © 2018 by E. B. Goodale. Illustrations reproduced by permission of the publisher, Greenwillow Books, an imprint of HarperCollins Publishers, New York. Preliminary images used by permission of E. B. Goodale. Wow, I think kids would so relate to Lulu. Who hasn’t had an imaginary friend? The cloud page is my favorite. Jules, yay for a first good week of school. 1. A wedding of friends. 2. Writing and reading a poem for the wedding. 3. Catching up on Grace and Frankie. 6. Book club lunch with a bookstore stop. Hello, E.B. and Akaraka! Always cool to see the process. Jules: May the school year treat your daughters wonderfully. Remind me, have you watched BtVS before? Jone: Sounds like a good week! Jone, so excited for you that, in your retirement, you can do even more traveling. Your second kick is SPECIAL. LW: Nope, this is our first time watching it. My girls became quick fans. … Your last kick: YAY! Such a fun story, I really like the wind illustration too, and naptime, with the girls reaching fingertips towards one another. Jules – here’s to making it through busy work weeks and yay for a good firts week of school. Jone – what a great week full of friends and books. LW – love all your kicks, but especially 3-6, they trip delightfully after each other. 1) surviving a very packed work week. 3) set a goal to make a 2 minute pitch to the governor at an event this week. Work had me running late, but it all fell into place perfectly – pitch was made, then short touching base with my reps, then I headed home. 4) Found some beautiful golden beets at a Farmers Market this weekend. Roasted them with spices. Yum. 5) We got some much needed rain yesterday. 6) Sweet silly Daisy. She is always ready for Netflix and Chill after a packed week. 7) Nerd moment after an appellate attorney told me I was right about a legal issue. 7.5) My new standing desk in the home office – I love it! And I get to look out the window at the finches and other birds around the birdfeeders and birdbath. Rachel, what a good week for work and advocacy. Also, I love beets, though I’ve never had golden (only red). When I was little, I’d visit this elderly lady who lived two houses down and would feed me hot tea and beets with sugar on them. Enjoy that standing desk — and the finches! Have a good week, you all.